MomCoach: What's cooking? Wednesday - Better than Pumpkin Pie! What's cooking? Wednesday - Better than Pumpkin Pie! I'm so excited for Fall! That means I can make this dessert more often! 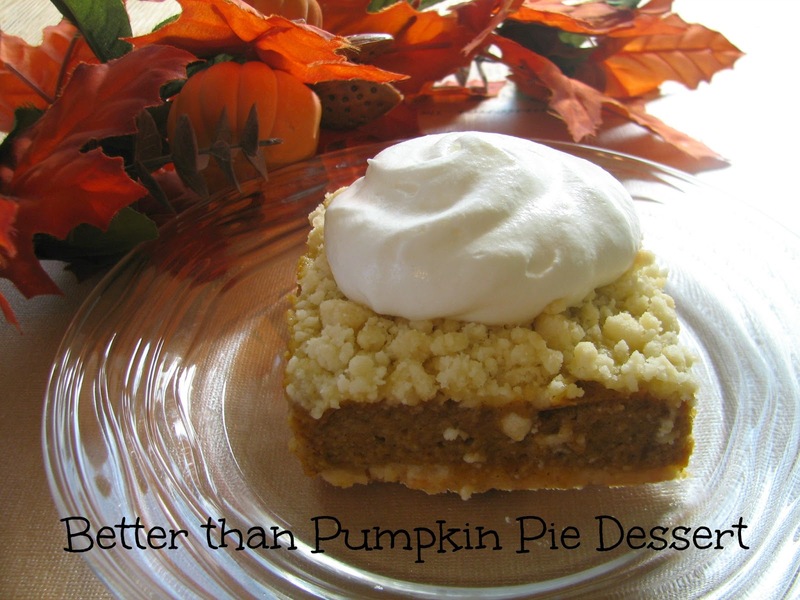 It's easy (no making pie crust), and makes you feel like you're eating something healthy because it's pumpkin. :) If I had to pick a non-chocolate dessert, this would be first on my list! Mix dry cake mix and melted butter together until crumbly. Pat 1/2 of the crumbs on bottom of a greased 9X13 pan. Mix pumpkin, sugar, eggs, and spices with wire whisk until blended. Sprinkle remaining crumbs evenly over top. Bake in 350 degree oven for about 30 minutes or until lightly browned on top. Let cool. Serve with whipped topping.